While driving along the west coast of Ireland, I accidentally discovered one of the many hidden treasures of Connemara. On the N59 road from Westport to Clifden, I was assaulted by an unrelenting downpour and pulled over in the little harbor town of Leenane to let it subside. I had planned on driving a bit further to stay overnight in Clifden, but when I glimpsed bits of the Tudor façade of the Leenane Hotel through the walnut-sized raindrops, I decided on a change of plans. The stately old-world structure stood welcoming in the downpour, and my thoughts turned to a steaming cup of tea and a hot bath. Little did I know just how unique and satisfying that bath would be. The Leenane Hotel has been in the business of comforting weary travelers for centuries, but attached to the hotel I found the Connemara Seaweed Baths, a mini-spa experience available to the general public as well as hotel guests. Fresh seaweed is harvested daily from Ireland’s only natural saltwater fjord, located just outside the hotel, and combined with warm salt water within vintage white porcelain bathtubs. The heat releases nutrients in the seaweed, and this primordial soup becomes a relaxing elixir that is known to relieve stress and muscle aches. Since ancient times, mineral-rich seaweed baths have been used to treat everything from arthritis to skin problems, and more recently touted as one of nature’s finest natural detox treatments. 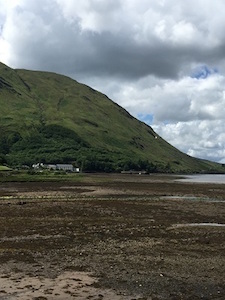 The Leenane Hotel and Connemara Seaweed Baths can be found on the Clifden Road (N59) in County Galway, situated at the head of Killary Harbor on Ireland’s only natural fjord. More than 50 rooms offer a view of the fjord, many with private waterfront balconies or entrances. The hotel’s exceptional on-site restaurant offers local produce and seafood, and bed and breakfast packages are available. At 25 euros (a little less than $27), the seaweed baths are very popular but well worth the wait. The hotel and baths are seasonal, and usually close in November and reopen again around Easter.